The Torah, the first 5 books of the Jewish and Christian bibles, is the foundation and cornerstone of the Scriptures. A lot of people ask why I place so much importance on Torah. Why not grace? Why not forgiveness? Why not just Jesus? My answer is that there are already enough folks teaching grace, teaching forgiveness, teaching "ask Jesus into your heart." We've made a lot of converts this way, but not nearly enough disciples. Torah is a disciple-maker. It contains hands-on, righteous instructions from God himself on how to live a holy life for God while on earth. Without Torah, there would be no Israel, without Israel, no prophets, without prophets, no Messiah, without Messiah, gentiles would still be worshipping the Greco-Roman pantheon. Torah is a prerequisite to grace and forgiveness. Torah is a prerequisite to Messiah. Torah is the foundation, and it is our inheritance as lovers of the Messiah of Israel. Torah is big! Jewish scribes estimate there are 613 commandments in the Scriptures. That's a lot of commandments! A summary of the 613 is found in the Decalogue, what's called the 10 Commandments, or more accurately, the 10 Statements. The 10 commandments can be divided into 2 groups: 6 commandments about loving others, 4 commandments about loving God. Love the Lord with all your heart, soul, and mind. Love others as you love yourself. Messiah told us that all the Torah and the prophets hang on these 2 commandments. It's amazing to think that all the hundreds of commandments in Torah -- covering everything from clothing to diet to atonement to God's own appointed times -- can be summed up in these 2 commandments! I've created a little diagram of this profound statement. 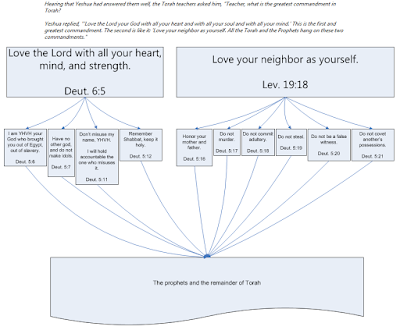 Interesting to visualize this -- all the Torah hanging on these 2 commandments, a summary of the 10 commandments, a summary of the whole Torah and prophets! The importance of these 2 commandments should not cause us to discard the other 611, as some in Christianity have done. As Paul says in Romans, the whole of the Torah is holy and righteous, beneficial for our instruction. I firmly believe that Torah is righteous instruction for all, not just the physical children of Jacob. For example, Isaiah told us even gentiles should not be separate from God's people, but should welcome shabbat with all Israel. And Zechariah states how all nations will one day go up to Jerusalem to celebrate the Feasts. And Paul tells gentile Corinthians to keep the Passover, one of God's appointed times described in Torah. The Torah is the plumb line, our reference point of right and wrong. Discard it, and we're lost in a sea of moral relativism, as some of the Christian Church is today. So, AMEN! The Torah is righteous for all, God's own instruction and wisdom for Jew and gentile. I just love your post on the Torah. Thanks for sharing and it was certainly quite an education. Toda.